At Ekambareswarar Temple Kanchipuram, it is believed that Godess Parvati worshipped Lord Shiva in the form of a Prithivi Lingam, or a Shiva Linga made out of sand. This was made under a mango tree. Legend has it that there was a flood in the neighbouring Vegavati river. The waters threatened to engulf the Shiva Lingam. 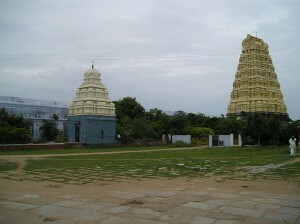 Parvati or Kamakshi embraced the Lingam. Shiva, touched by the gesture married her. In this context he is referred to as ‘Tazhuvakkuzhainthaar’ – He who melted in Her embrace. The significance of the incident marked for the worship of Shiva and Parvati in a common sanctum without a separate sanctum or shrine for Parvati, as she is worshipped along with Shiva in all Shiva temples in Kanchipuram. The divine union marks the spiritual significance of meditating on the Lord to ultimately become one with Him.